I hope you all enjoyed the last brain teaser. I trust your eyes didn’t sting too much when you stumbled out of the darkness and back into the light. Here’s the next case and this time we’ll play with some numbers … Yep, it’s data interpretation time. Traditionally, fellowship exam candidates do well with these type of questions; probably because the need to do some rapid maths scares the be-Jesus out of most of us, so we practice lots of them. That’s not a bad thing, because getting through a handful of data questions can be done quickly if you know a couple of standard calculations and you can buy yourself a good chunk of time to put towards other trickier questions. Just remember to practice the other question types as well. You’ve been asked to accept a 31yo lady to your unit from the emergency department. She is day 10 into a fertility treatment program under the care of her private obstetrician and has presented to the ED with increasing dyspnoea, nausea and abdominal bloating over the past 3 days. On examination she has an SpO2 of 98% with notable decreased breath sounds in her right base. Her heart rate is 114bpm and her BP is 106/68mmHg. She is alert and afebrile. a) Describe the key abnormailties. b) What is the diagnosis? c) What other investigation should be performed? 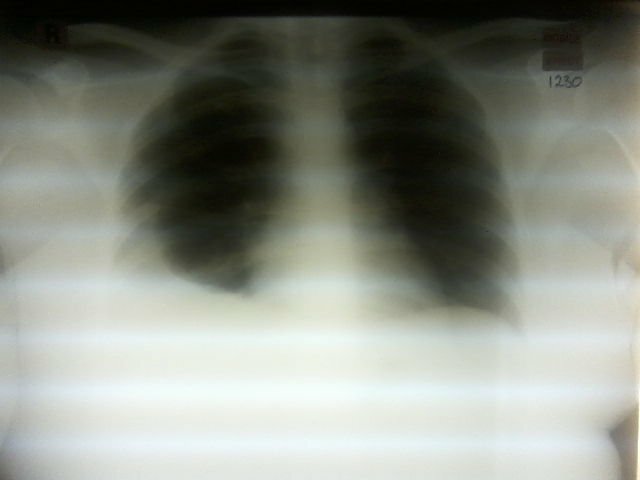 Describe this patient’s chest x-ray. What is the implication of a positive BhCG at 2 weeks after administration of the medication that precipitated this condition? Outline the key elements of treatment for this condition. Careful! The answers are down here. Polycythaemia (Hb 17.6g/dL) due to haemoconcentration (Hct 0.50) from third space fluid losses. The Hct meets RCOG Grade III (Severe) criterion. Respiratory alkalosis, likely secondary to hypoxia (pulmonary oedema and pleural effusions are complications) and limited diaphragmatic excursion (due to ascites). Associated occult raised anion gap metabolic acidosis (The pH should be higher for the PaCO2 and the HCO3 is lower than expected with a borderline negative SBE. The calculated anion gap is 26), possibly due to the AKI, though no lactate level is provided. c) An ovarian ultrasound – The size correlates with RCOG grade. Acute abdominal pain should prompt evaulation for ovarian torsion. Moderate sized right side pleural effusion (Also look for evidence of pulmonary oedema). BhCG that is detectable more than 2 weeks after therapeutically administered exogenous BhCG suggests implantation has taken place and the patient is now pregnant. This is then termed late ovarian hyperstimulation syndrome and, as the production of BhCG will now persist, results in a more prolonged and severe course of OHSS. Judicious volume balance to preserve renal function while avoiding/limiting pulmonary oedema or pleural effusions. Usually require initial volume bolusses and then approximately 2 – 2.5L/24hrs. Therapy is supportive as OHSS is a self limiting condition. Ensure the involvement of an obstetrician with experience in the management of OHSS.